In March of 2002, a firefighter made a stunning discovery. He found a piece of steel from one of the Twin Towers that collapsed on 9/11 with a page of the Bible fused to it. But what was really inspiring was the verse from the Bible that was fused to the steel… almost prophetic and close to a command. It’s beyond coincidence that Jesus’ Sermon on the Mount would be the passage that was merged with steel from one of the buildings Jihadist terrorists took down on that fateful day of 9/11. Through all the death, blood and tears, God’s word still comes through. How awestruck this firefighter must have been when he realized what he had found. This is a piece of history with holy ramifications. The Pope even went to see it. I’m not quite sure of the exact meaning of ‘retaliation’, but I don’t believe that ever took place. I’m still waiting for justice to be served over the deaths of almost 3,000 Americans. That judgement may be God’s to deliver. So many chapters. So many verses. But these were the words — from Jesus’ Sermon on the Mount, in the Gospel of Matthew — found permanently exposed at Ground Zero after the Sept. 11 attacks. 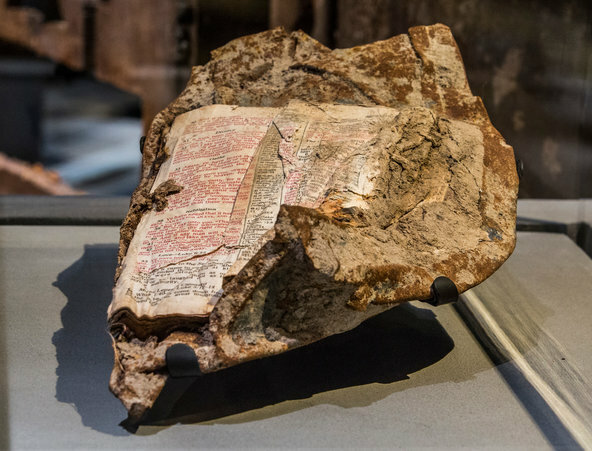 The pages of the Bible in which they were printed had fused to a chunk of steel as the World Trade Center collapsed, to be found only months later. 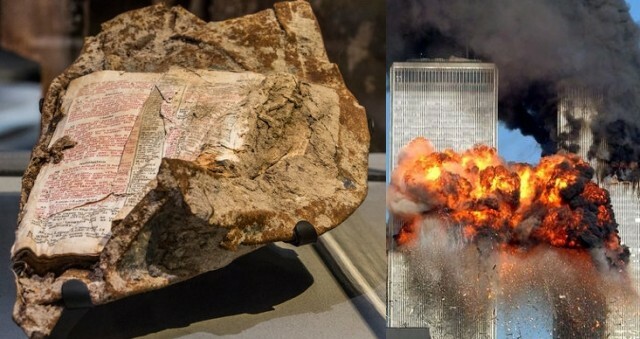 A firefighter found the fragment in March 2002, under the Tully Road, a temporary truck route that covered the last remnants of the south tower. He called out to the photographer, who happened to be nearby. Meyerowitz explained further, “My astonishment at seeing the page that the Bible was open to made me realize that the Bible’s message survives throughout time, and in every era we interpret its teaching freshly, as the occasion demands.” And although I know that forgiveness is divine, so is retribution in some instances. Regardless, the wisdom of Jesus speaks to us in our time of need. It’s a blessing of its own. But even as we seek to serve justice and defend the helpless, we can’t afford to let our hearts turn to evil through hate. This is why I feel that what President Trump did in Syria was the right thing. As a Christian, I cannot stand by and just watch as genocide is dealt out… no matter the religion or how I disagree with it. Sometimes force is required to stop those who are evil. This miraculous reminder of Jesus and 9/11 is yet one more reason that America has a moral obligation to ensure that we defend the defenseless and always remember ‘Never Again’.